I made this for my friend for Anime Evolution. 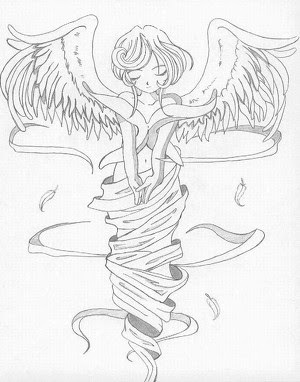 This is the character we were insired after, Nobel Scarlet from Ah My Goddess. 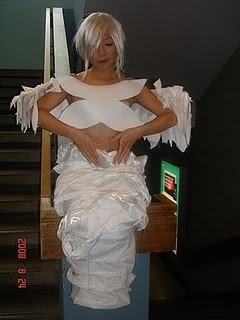 She is the angel for the Goddess Skuld. This outfit comes in 4 pieces. a wig, would you believe me if i told you this was the easy part of the outfit? wings, funny story is that she was responible for bringing wings, but she left them at home. 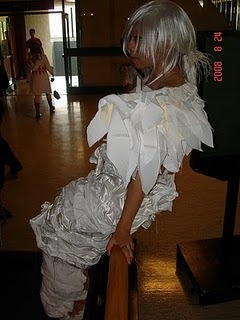 So we made one quickly wich some poster paper in the shape of wings, and cut up fabric pieces as feathers. Than we drapped/glued them onto the wings so they hung and flittered in the wind. clothing, so as you can see the character's clothing is rather odd shaped and lacking. I used a large piece of craft foam, cut out the shape, and used an iron to heat up and mold the curls as it cooled.